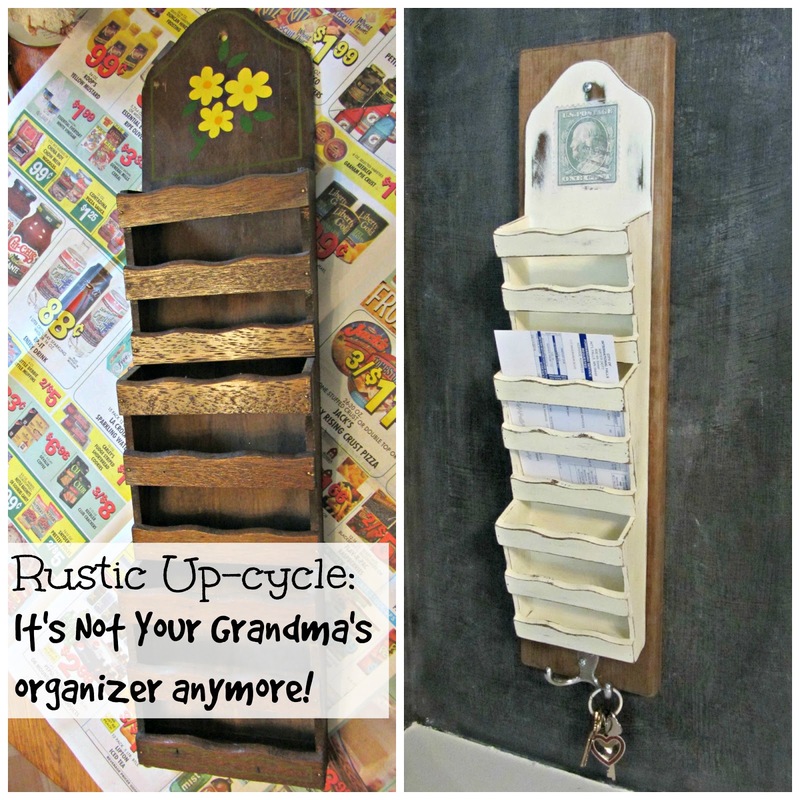 Rustic Upcycle: They're Not Your Grandma's Mail Organizers Anymore! I love to find cheap thrift shop items to up-cycle! Like this 1970's colonial styled mail organizer, complete with metal eagle (and I think, a cobweb in there too). This was one dollar. 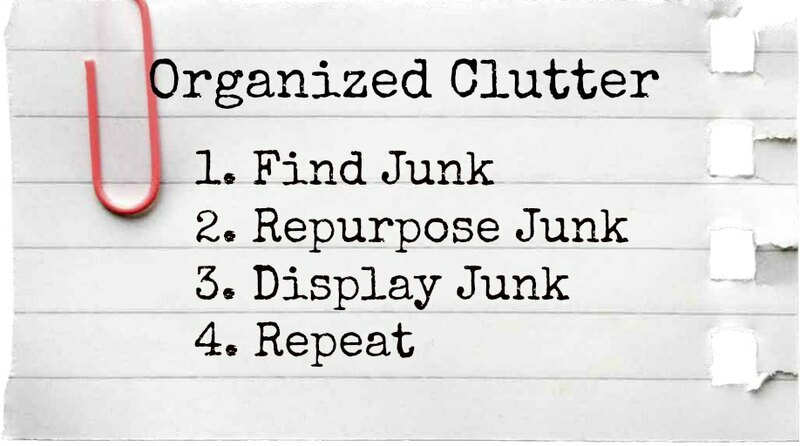 I have seen many similar mail organizers. $1 at the thrift shop. First up, a paint job with Annie Sloan Chalk Paint in Old White. I found this old 4 cent stamp graphic on the Vintage Fan Girl' Blog here. Remember to reverse the image before the Mod Podge transfer. I found a great place to make color copies for me for just a quarter. I use Homeroad's technique for Mod Podge Image Transfer. As you can see I also distressed the organizer with sandpaper. Sometimes I rub off a little of the image accidentally but it doesn't really matter. This is distressed and rustic! The image will darken after you wax it. in under three foot scraps for 49 cents each at Menards. I rough up the edges with a rasp, and use the steel wool and vinegar method to darken and age the boards. I didn't mind that the screws show either. Most rustic goodness. I also added a metal number one with E6000, just for looks. From outdated and awful to rustic cool! Here's $1 mail organizer number two from the same thrift shop. This one has three slots. I used the same steps to up-cycle this organizer. I found this postage stamp graphic at Knick of Time Interiors. I added key hooks to the bottom of this organizer. Easy updates! You can make one or two, too! Love them....I've 2 in the garage waiting for me to update them to the modern world. !! Enjoy what's left of the weekend. I love them! I love the graphics you chose. I find them at thrift stores all the time. They sell very well and yours are awesome! They look great!!! Love the transfer!!! These are so cute! I love the postage touch, very nicely done. 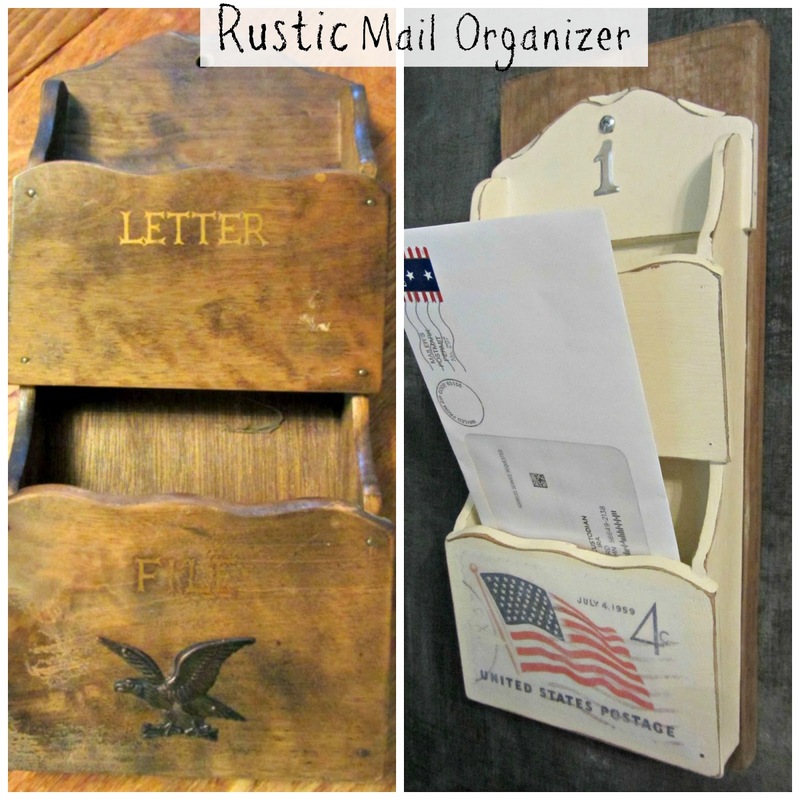 I found a cute wicker mail organizer and used images from Knick of Time too! I like how you added the board to the backs of these...my favorite was the no.1 with the flag! Clever! Your makeovers look terrific. Gorgeous! I love them both! Cute idea, Carlene! You did a great job with the design transfers! I was looking for one of those organizers to hold my eraser and chalk in the kitchen, but I haven't found one in the size I need yet. It'll show up eventually. I love the new look of your blog! I spent a day cleaning up mine, but I'm still technically challenged, so it's a work in progress. Enjoy the holiday! Those are really cute, Carlene! I've never tried the printable thing yet... you make me want to! The designs help make the project, big time! What transformations! These look great, Carlene! Love these transformations and the graphics you added are perfect! Thanks for sharing at Vintage Inspiration Party.